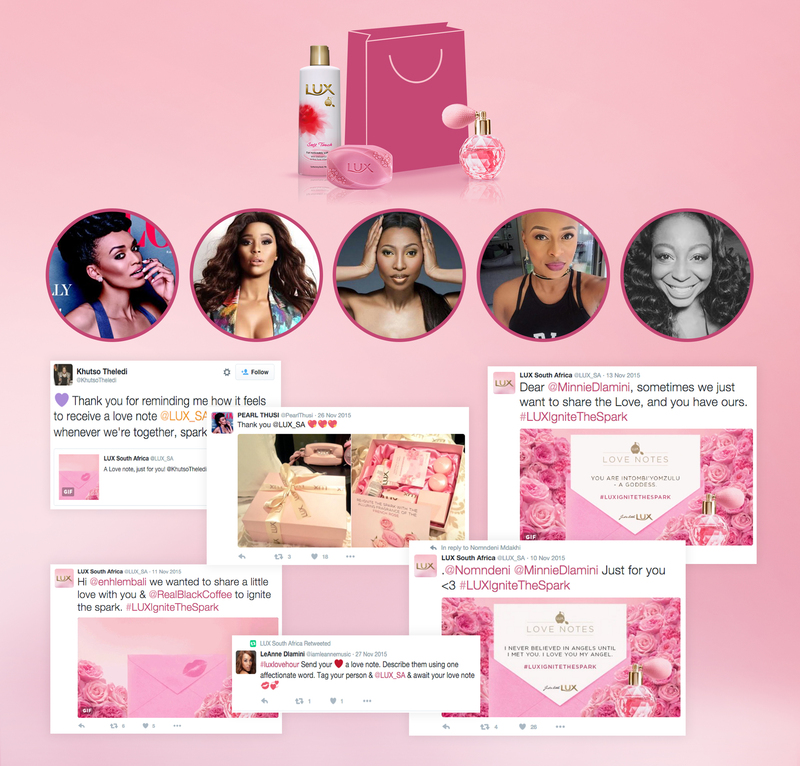 We needed to get beauty bar users to switch to LUX Soft Touch, communicating that it ignites the spark in your relationship and amplifying the product claim: “World Class perfumes for Irresistible Skin”. Based on the insight that sometimes the softest touch, like a surprise love note, can reignite the spark we wanted to help women across the country ignite the spark in their relationships by facilitating their love note process on digital. In preparation for the campaign, we hand-picked key opinion formers and sent them product packs to get them talking and writing about the campaign and the French Rose fragrance. 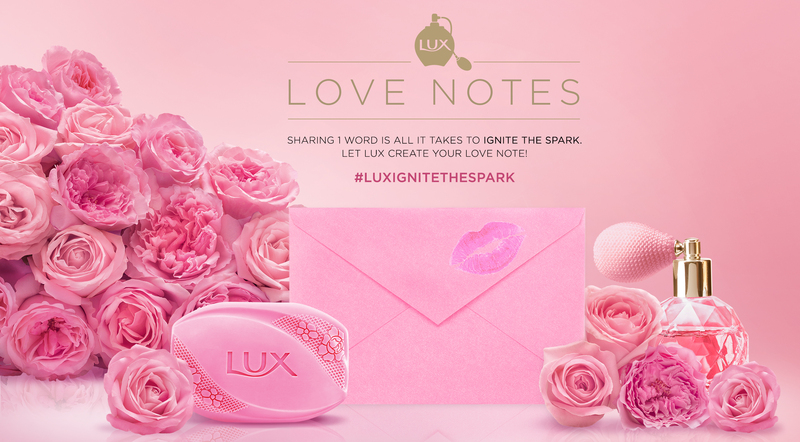 With anticipation in full bloom, we launched LUX Love Notes. Taking inspiration from the product’s French Rose fragrance and the French romance appeal, we reignited the spark on Facebook, Twitter and Instagram, creating real time bespoke, scripted love notes for our fans. 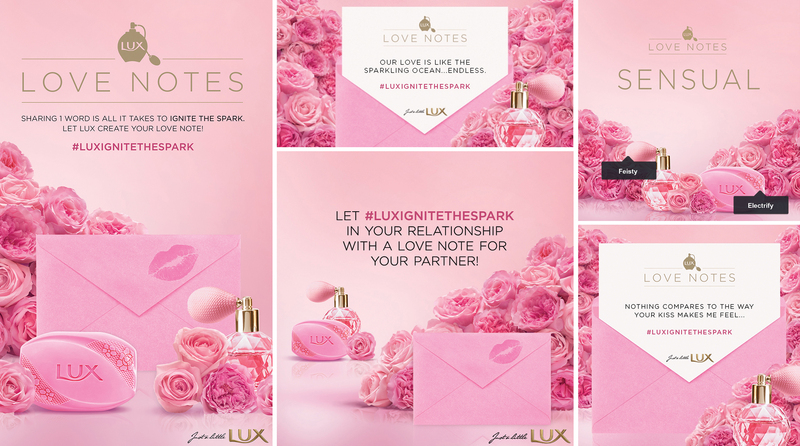 #LuxIgniteTheSpark was innovatively launched with a LUX Love Hour on Twitter, a dedicated time where fans could send in 1 word that defines their relationship with their partner. Within minutes a team of writers and designers interpreted, scripted and designed these words into personalised, animated Love Notes, before posting them to both partners almost immediately! Unbeknown to our fans, we took a sneaky look at their profiles within this time, ensuring each love note was personally tailored to its recipient. A similar approach was adopted on Facebook where fans could comment on our posts with 1 word that defines their relationship. A dedicated community manager personally sieved through all these comments, replying to each and every one of them as soon as they came in. 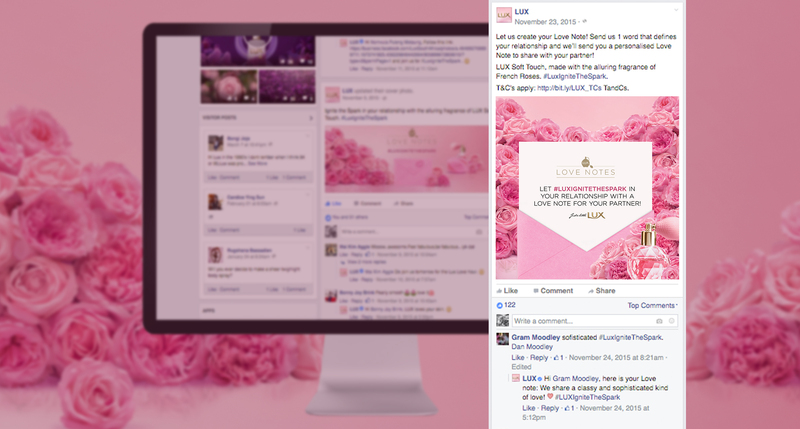 In addition to Facebook and Twitter, fans could “create” Love Notes on Instagram by choosing between a variety of words by “placing a soft touch” on them. These words lead them down different paths to a final love note to share. 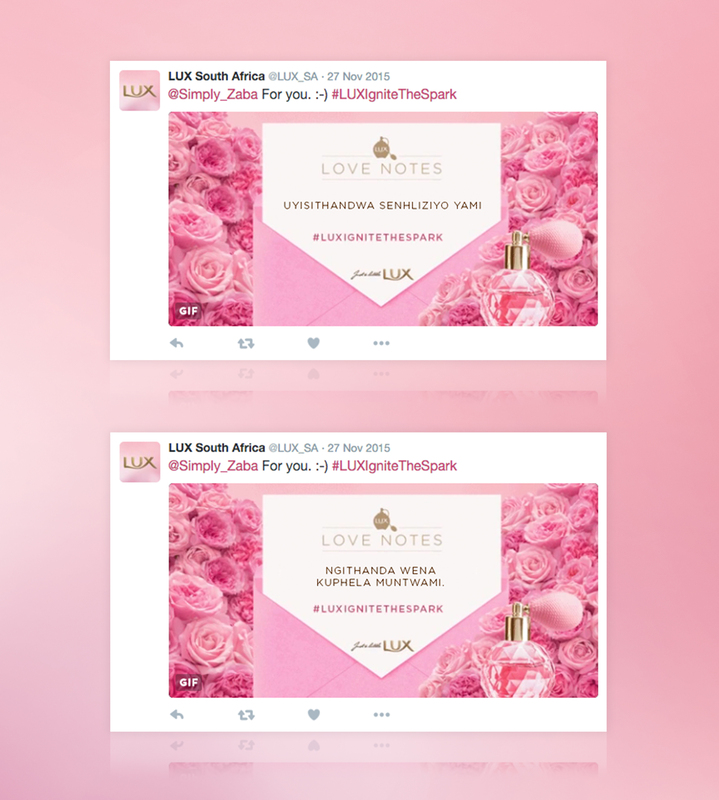 Love notes were written in several South African languages, positioning LUX Soft Touch as a product that ignites the spark in SA. 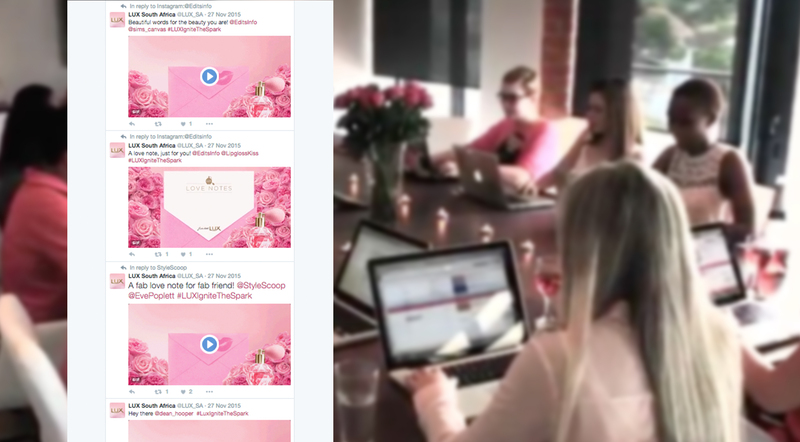 Thousands of Love Notes were shared through creative use of static and animated content during the campaign period, generating over 19 million impressions in the process.